Christine Broom (left) presents the Award of Merit to Claire Neal. 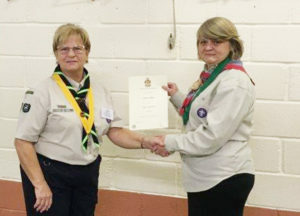 Melksham’s Scout leader was given the Award for Merit last month for her years of ‘outstanding service’ to the Scout and Beaver groups in the town. Claire Neal, Group Scout Leader and Beaver Leader in Melksham, was given the award, formerly known as the Medal of Merit, by district commissioner Christine Broom. Christine said, “Claire has guided the Melksham Scout Group over many years currently as the Group Scout Leader and as the Beaver Scout Leader. “Group and Colony numbers have always remained healthy which is testament to the quality of the programme and the continuous hard work Claire has put into running it. “Claire’s contribution to Scouting in Melksham has been invaluable; without her dedication and commitment over the years there would not have been a Beaver Colony to feed the Cub Pack. “Claire has always supported the group, district and county fully, whether at district events, St George’s Day celebrations or the many other ways her Colony interacts with themselves and the rest of the movement. This entry is filed under Latest News and tagged Award for Merit, Claire Neal.